That's my little reference to Paul Harvey and his "Rest of the Story" programs. I would always get hooked on listening to those while driving in the car, and if I reached my destination, I wouldn't be able to get out of the car until I heard "the rest of the story"! (For those of you who have no clue what I'm talking about, just skip on ahead...) Just giving a clue to my age here. 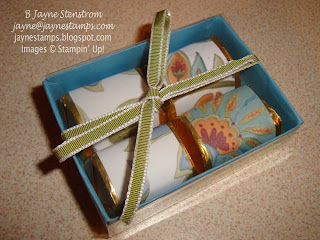 Anyway, today I have the rest of the projects from our stamping day last week. First up is Lou Ann's card. I love the vintage look of this! She used lots of great new things on her card including the oval Designer Frames Textured Impressions Embossing Folder, the Stripes embossing folder, Well Worn Designer Series Paper, and the Easy Events stamp set. 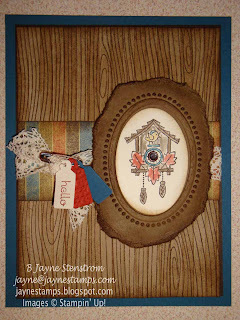 Also used on this card were the Woodgrain background stamp, Victoria 5/8" Crochet Trim, and Vintage Trinkets. It's hard to see, but in the center of the cuckoo clock is one of the Vintage Trinkets brads. Did you know that they look like little buttons? So cute! Almost all of the edges are sponged, which adds to the vintage look. I love sponging. Ask any of my customers or good stamping friends and they'll tell you. Next is Judy H's card. You may not be able to tell in this picture, but the "cake" is made from chocolate nuggets!! This was an idea that we saw on main stage at Convention. I was so glad that Judy brought this for us to make because it had been on my "to do" list since I got back, but I wasn't sure when that was going to happen. The lacy table skirt is made with the Lace Ribbon Border punch. Clever! 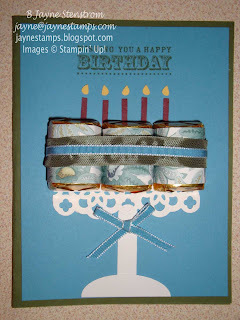 I love the use of the Beyond the Garden Designer Series Paper in this card that Diane K. designed. Many of our DSP patterns are quite large and sometimes it's hard to know what to do with it on a card. I think this is such a great idea! By cutting the DSP square into smaller 1" squares, it just gives it a little more interest and almost a window pane look. And this sweet little box was a gift from Sara to all of us. She had made them up before we got together and just gave them to us. Of course, I love chocolate, so besides being adorable, I like the candy too! 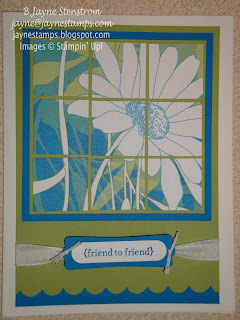 I think Sara used the Matchbox Bigz XL Die with a clear window sheet for the "sleeve". Isn't this a great idea for a little thinking of you gift for someone? This is also a good time to remind you that the Buy 3, Get 1 Free Designer Series Paper special is only available through next Wednesday. There are some great ideas just on today's post that use the DSP and now's your chance to get some of it for FREE! You can order yours by going to my demonstrator website HERE.